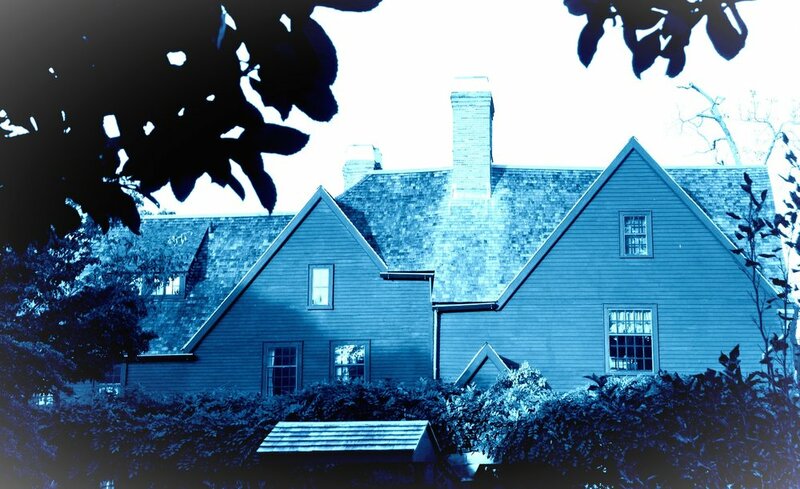 The House of the Seven Gables via Peter Eimon. Derivative. Yesterday, clouds covered Barrow with drizzle and gray. What is it? I wondered. It hulked dark and jagged. It is hard to understand now. By some trick of perspective and shadow and rain I could see every one of the gables. This seems like a strange recollection, since some of the gables are in the rear of the house. But I could see all of them and the seven gables were long and sharp. A colossal elm tree blocked most of the house but the seven gables rose into the sky. The black branches of the elm reached up toward the gables in thousands of narrow fingers. Decaying leaves leftover from the late winter overflowed the gutters. Years ago, the house had been painted a light shade of gray. Now, the weather-beaten paint had begun to peel back to reveal streaks of red paint underneath. The rain was seeping through cracks in the gutters and down the siding and with the red paint peeking through the gray it looked like red dribbling down the sides of the house. When the lightning flashed, the house shimmered and danced as it blended with the sky and the cracks of red paint underneath the gray gleamed like blood in the moonlight. The large windows in the front gables reflected each flash of light and they seemed to look out at me. The front door of the house, a massive sixteen-panel oak door, almost as big as the door of a church, yawned from beneath the branches of the tree, in the shadows of the seven gables. I was sitting in the passenger seat of the realtor’s SUV. She smiled at me hopefully. We had been driving around Barrow and Salem looking at houses all day. Maybe the whole scene with the sky and the house disturbed me because I felt hot and sick and didn’t want to leave the car. Janine got out of the driver’s seat and stood in front of the car and clutched her folder of listings to her chest. She leaned forward and squinted to see into the car so I felt like I had no choice but to join her. As we got closer to the door and past the huge trunk of the elm tree I could see how badly the gray paint was peeling to expose the red. The house looked like a scratched body. If it was a body, I couldn’t tell if it was alive or dead. I hated it and wanted to leave. She chattered about the big and beautiful elm and the large lot and the square footage of the house. Everything would need to be redone, she said. We’d have to take that into account if we made an offer. New gutters, a fresh coat of paint. We were walking on a brick path, and the roots of elm tree were pushing up from under the earth and dislodging the bricks. Moldy Doorway via Peter Damsten. Derivative. “. . . owners died years ago,” She was saying. “From what I hear the estate was very complicated and the children fought over the property for over a year before it went on the market. Hopefully on the inside it just needs to be cleaned up a bit,” she said. We were standing underneath the front gable now, before the huge door. The bricks in the front patio beneath the arching entryway had shifted into a series of slimy shallow pools. The realtor prattled on and then opened the door. She was saying something about a distressed sale and the house being on the market for over a year. Inside the house was clean and uncluttered. “They must have really come in here to clean this place up when they lowered the price last week,” Janine said, impressed. When she flicked on the lights, the dark hardwood floors gleamed suddenly, reflecting light from an antique chandelier hanging above. That first impression of the house is vivid in my memory. I have not kept a journal in years. I keep my intellectual research notes, but this is different. Something about the feeling of that house, and the doors, and this point in my life, prompts me to document. Since this is the beginning of so much. Barrow Living Room. Donald Stull. The interior was nothing like the worn, peeling, dripping exterior. The previous owner had just updated everything before unexpectedly passing. Some remnants of a deep posh cultured past was preserved in fixtures like the antique lamp, and an ornate, hand-carved banister on the wide stairwell up to the second and third stories. But the majority of the place, from the crowned moulding to the cabinets and appliances had been renovated with a decidedly modern, antiseptic, Ikea-like aesthetic. And all in white, and off-white, and stainless steel. “I can’t believe how clean all of this is,” Janine kept saying as we walked through the place. “Where’s all the dust?” The same dark hardwood floors, another vestige of a storied past, gleaming throughout. “This place is so nicely updated,” The realtor said as we walked back out the front door, through the alcove, and into the warm gray drizzle. “The exterior needs a lot of work,though.” She stumbled as she caught her heal in a crack in the bricks where the roots of the elm tree had displaced them. “It might be a steal.” she said as we got into her SUV. “It’s not too far from the university,” she added. Her voice went on some more as she drove me to the closest rail station. That must have been the seventh house she had shown me. But it was the only one I remember distinctly. The others were all small, two bedroom, one bathroom; or two bedroom, one-and-a-half bathroom; or one bedroom, one bathroom. “The perfect size for me,” the realtor had explained. I don’t even recall what else in either Barrow or Salem. I guess I should have kept her flyers so I could look at them. I think I lost them when I fell asleep on the metro on the way back to Logan. But I don’t know if I’m even going to be offered the job. Professor Strange had said he was hopeful they could offer it to me. He’d have to check with the rest of the committee but I was the one he wanted. And that he went so far as to set me up with that realtor before I left town seems very positive. Professor Strange told me he would call me within the week. But no one gets offered a job after their first academic interview, right? Ed told me not to get too hopeful despite Strange’s assurances. “You can’t try to gauge these things because they are deliberately opaque,” he said. Everything's happening so fast.